*On a Sunday morning in early September, Alex Matthews went out in search of the perfect Rosh Hashanah apple. Alex is a farmer, but Appleton Farm in Ipswich Massachusetts, where he works, does not grow fruit (aside from delicious berries). So he drove south, with his girlfriend, in his green hand-me-down vehicle, to Cider Hill Orchard in Hamilton. There, he would sample all the early season apples he could stomach. 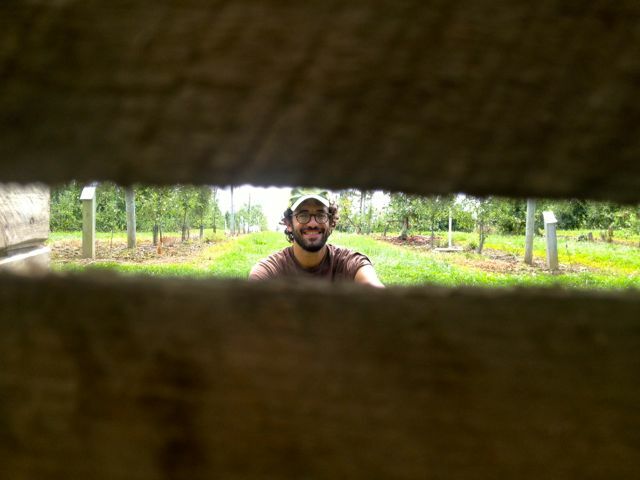 The orchard lies on 100 acres of rolling hills, just behind the cornfields and the blueberry patch. If mise-en-place could start in the field, the farmer did a good job of placing two deliciously complimentary ingredients side by side. The sweet corn and plump blueberries would be a perfect duo of ingredients in some late summer baked good, like a blueberry-corn muffin. Alex stopped at the counter to pick up his harvesting paraphenalia, including a varietal guide to today’s apple offerings. He set out, Gabrielle by his side, to sample apples. His mother, he knew, would be pleased to receive some of them, orchard-fresh, in the hands of her youngest son when he returned home to Riverdale on Erev Rosh Hashanah. 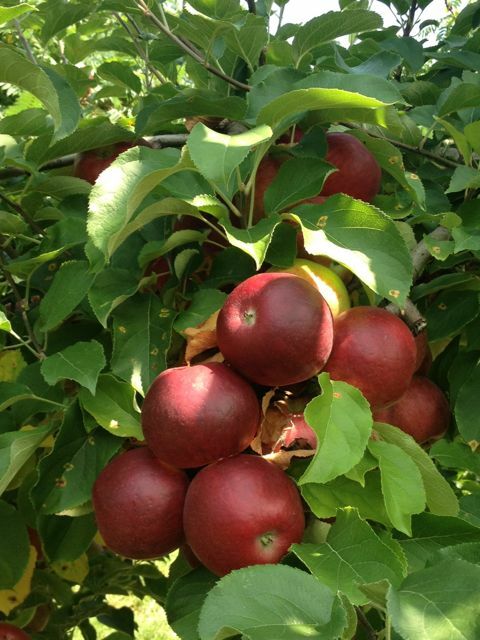 What is the perfect Rosh Hashanah apple, you might wonder? For Alex, it is one that is slightly tart, because it will be accompanied by honey. The tradition for the Jewish new year is to eat apples and honey, symbolic of a “good and sweet new year”, or a shanna tova u-mitukah, as the Hebrew phrase goes. Most other visitors to the Orchard were families, young parents and small children, out picking fruit together, probably to bring home and bake into pies. Alex and Gabrielle stood out, as a young couple, out for a stroll. Alex is a dashing young man, with dark hair and a well kempt beard and mustache. His arms are deeply tanned by the summer sun, his musculature defined, and his hands stained with earth. His smile is quick to appear on his face, and he is polite and sweet-as-can-be. When you look a little closer you see that he has ear piercings and the trace of a nose pierce. It may cause you to grow curious about this young man, like an apple that is too complex to describe as simply sweet. Like an apple that you want to appreciate. Alex tasted of the many rows of apples. Some deep red, others fading from green to pink, and still others yellow or just pale green. The Burgundy, the deepest red of the apples, a surprising sight for such an early stage in the season, was Gabrielle’s favorite. Sour and sweet, slightly acidic, crisp and dense, this apple had a depth of flavor she enjoyed, especially next to the Red Free apple which was sugary sweet. Alex enjoyed both those varieties, but he did not enjoy the Gingergold, a yellow apple that was dull in flavor and quite mealy. He was excited to try the Zestar!, a name he pronounced with as much zest as he could muster. It did not prove to be a disappointment. This apple was tender, crisp, very juicy, and sweet, but it also had a slight tang. This was Alex’s favorite apple so far. “I like how crisp and juicy it is!” he said. “This will be my snack apple this week,” he declared, plucking several from the carefully pruned tree. It looked like a pine tree in shape, tall and pointed at the top, with a wider body, its branches then curtailing inward toward the trunk. Apples are low enough to reach without any ladders at Cider Hill. Usually, at break-time on the farm, Alex’s snack is not nearly so local: a Chiquita banana. This week, the zestar! (the farm map gave this apple, exclusively, an exclamation point) will keep him tied over until lunchtime. But the apple would not do for Rosh Hashanah. Ultimately, the Rosh Hashanah apples were chosen to be Paulared, Gravenstein and Burgundy, each with enough tartness to contrast the sweet honey of the sweet new year. Gabrielle will not get to celebrate the holiday with Alex and his family, to her regret. But she did get to share in a delicious whoopee pie and apple cider donut that Alex bought for the two of them, while sitting by his side at a picnic table in the shade. What more could a girl ask for, to welcome the New Year? *Yep, I wrote this one in third person. Why? Just simple for the fun of it!